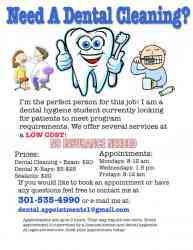 United States> Maryland > Dundalk > Classifieds in Dundalk > Services in Dundalk > Health & Beauty & Fitness in Dundalk > Cheap dental cleaning! Need a dental cleaning? I am a dental hygiene student at the dental hygiene school located in Dundalk, Maryland. We offer services at a LOW COST. Appointments may take up to 3 hours and and may require up to 2 visits. Each appointment is supervised by a licensed dentist and dental hygienist. All ages welcome. Book your appointment today!